I’ve decided to print a copy of this graphic I made up on foam poster board for the wall of my office. 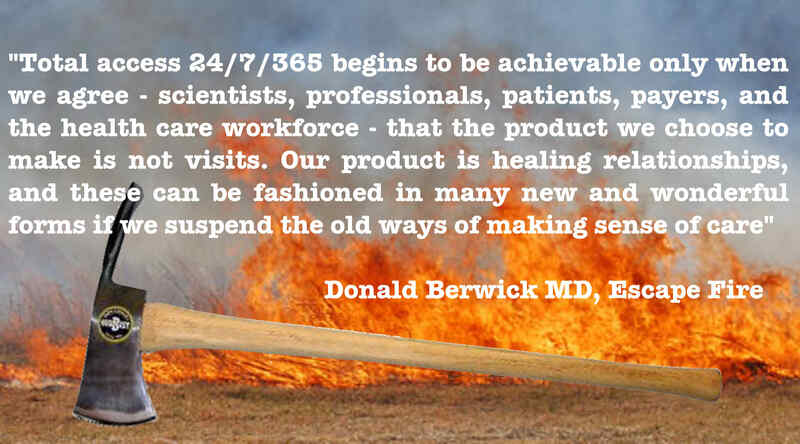 If you’re trying to work with Clinicians who think they might be better off trying to run up the cliff with their heavy Pulaski’s you might like to do the same (after sending them a copy of Dr Donald Berwick’s “Fire Escape, Lessons for the Future of Health Care). “All of this changes in the escape fire. The new system of access can be summarized in one phrase: “24/7/365.” The access to help that we will envision is uncompromising, meeting whatever need exists, whenever and wherever it exists, in whatever form requested. Before the howling starts, let me remind you of one precondition: Drop your Pulaskis. 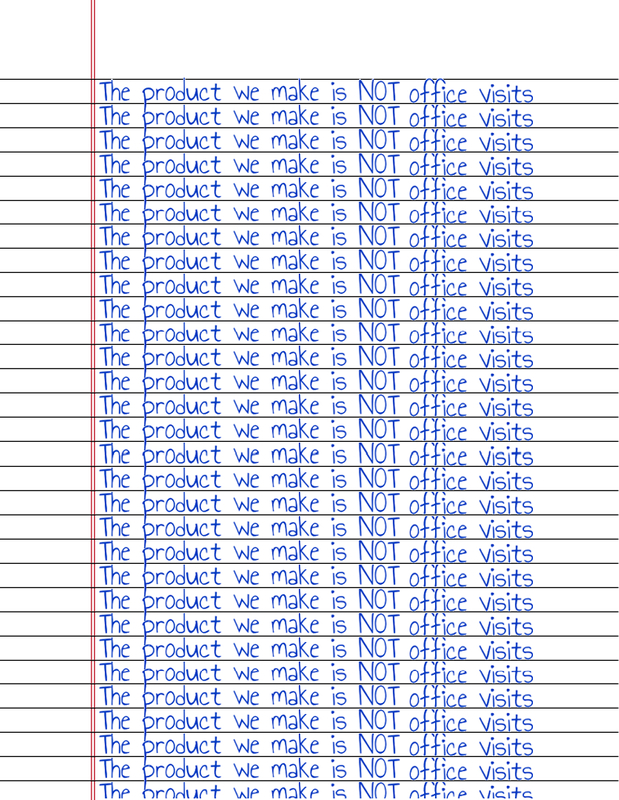 24/7/365 is not at all achievable with the current tools. Meeting demand this well within current frameworks is harder than running a marathon up a 76 percent grade. It cannot be done. Our Pulaski in the search for access is the encounter —the visit. Total access 24/7/365 begins to be achievable only when we agree—scientists, professionals, patients, payers, and the health care workforce—that the product we choose to make is not visits. Our product is healing relationships, and these can be fashioned in many new and wonderful forms if we suspend the old ways of making sense of care. The access we need to create is access to help and healing, and that does not always mean – in fact, I think it rarely means – reliance on face-to-face meetings between patients, doctors, and nurses. Tackled well, I believe that this new framework will gradually reveal that half or more of our encounters – maybe as many as 80 percent of them – are neither wanted by patients nor deeply believed in by professionals. This is an example of a problem so big that we have trouble seeing it. The health care encounter as a face-to-face visit is a dinosaur. More exactly, it is a form of relationship of immense and irreplaceable value to a few of the people we seek to help, and these few have their access severely curtailed by the use of visits to meet the needs of many, whose needs could be better met through other kinds of encounters. The alternatives to visits in the escape fire are many: self-care strongly supported and unequivocally encouraged; group visits of patients with like needs, with or without professionals involved; Internet use for access to scientific and popular information; e-mail care between patients and clinicians; and well-managed chat rooms, electronic and real, for patients and significant others who face common challenges. The fire is catching us quickly. It’s obvious we can’t out run it with the out of date tools on our backs but will history remember you as someone who ignored the teachings of experienced leaders (like Dr John Bachman) and decided you’d try your odds running up the hill with your heavy Pulaski (the in-office undocumented visit)?